It's the one event that has it all — the largest veterinary expo hall, hundreds of CE sessions, world-class entertainment plus revolutionary products — all under one roof at Mandalay Bay, Las Vegas! How do you measure your team's efforts? Are you looking to generate leads? Once decided, it's time to create a call to action. Understand what you want people to do when they visit your booth, and what actions need to be taken to achieve this. Reach out to current and prospective clients before the show. Send an email, direct mail, and/or phone call. Get them talking and build excitement to get them to your booth. Use social media to let your customers know where to find you at WVC. Example: Send out a tweet or message through Facebook promoting booth traffic. “Visit us at WVC, Booth XYZ, say the word DEAL to a sales rep and receive a free T-Shirt” Social media is a great way to generate buzz. Start your promotions 3-6 months prior to the Conference, continue onsite, and post-show. Think about starting a social media contest that would “end” with the winner being revealed at WVC. Make sure to follow up with your leads, cultivate them, and convert them to sales. Enhance your image & increase your presence. Review sponsorship & advertising items available at the show such as bag inserts, pre-show mailing list, or Education Program & Exhibit Hall Guide ads messaging and interactive advertising such as Vet Detective. When looking at sponsorships, think about how it can tie into your company values/mission/products. 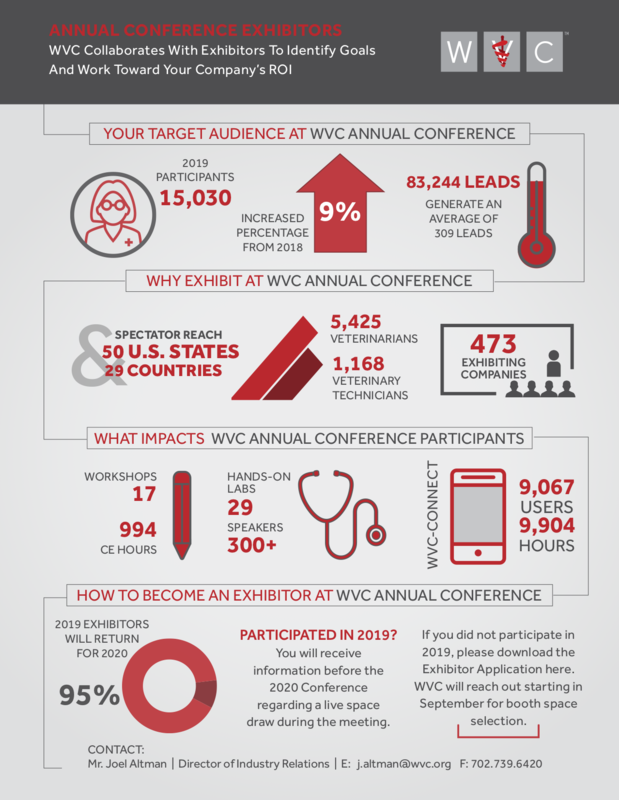 WVC offers an array of opportunities at various levels and will work with you to create a package that fits your needs, budget, and target audience. Make sure that your booth staff is registered and trained with your overall objective in mind. Schedule a pre-show meeting before the hall opens to review talking points, prospects, what to expect, schedule of events, preferred communication method during show, rules, and regulations, etc. Once the show is over, follow-up on leads within 3 business days with an email and then a personal phone call a couple of days later. All Eyes on Your Brand. please contact Lesa Boileau at l.boileau@wvc.org. Complete the form to share your suggestions.